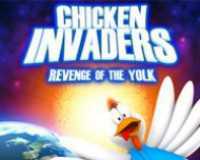 With Chicken Invaders 6 space game you destroy chickens, stones and everything that immerses you. Collect how many gifts and other materials from the falling eggs and pieces from the enemies you destroyed. Don't forget that you have the right to renew your life with the spoils of enemies and you can have more powerful weapons.